Whit Kirtland at Bradford Marine Yacht Sales sends news of a $2 million price cut on the 47m motor yacht Lionwind, jointly listed with Fernando Nicholson at Camper & Nicholsons. 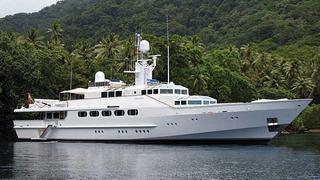 She was built in 1983 by Feadship’s De Vries yard to a design by the iconic Jon Bannenberg and refitted in 1997 and 2002. A Lloyd's-classed all-aluminium superyacht, Lionwind accommodates 10 guests in a master suite, two VIP staterooms and two twin cabins. Twin 3,000hp MTU engines give a cruising speed of 18 knots and a range of 1,500 nautical miles at 15 knots. Located in South Florida, Lionwind is now asking $6.9 million.